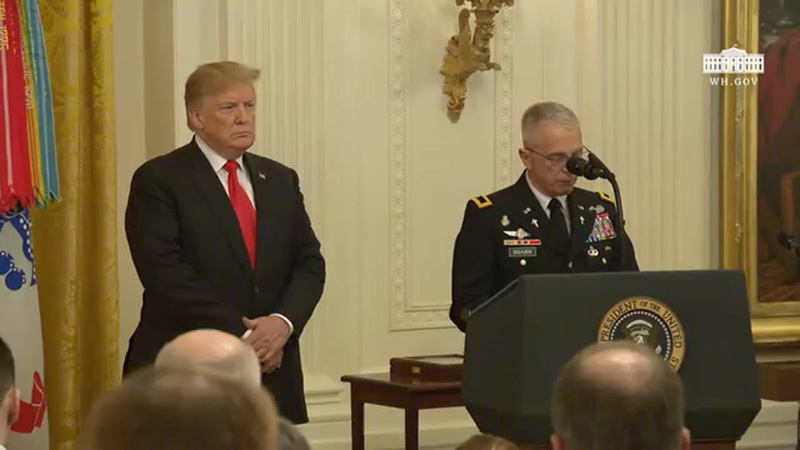 President Donald Trump awarded the Medal of Honor posthumously to Army Staff Sgt. Travis Atkins on Wednesday, saying that Atkins will be remembered "as the best father, and he will be remembered as the best soldier." Atkins' son Trevor Oliver, who was 11 years old at the time of his father's death, accepted the honor on his father's behalf. He was joined by Atkins' mother and father, Elaine and Jack Atkins, and Atkins' sister Jennifer. Atkins was killed in Iraq in June 2007, after tackling a suicide bomber to the ground in order to shield his fellow soldiers from the blast. "In his final moments on earth, Travis did not run, he didn't know what it was to run," Trump said. "He did not hesitate, he rose to the highest calling, he laid down his life to save the lives of his fellow warriors. In so doing, he embodied the deepest meaning of the the motto of the 10th Mountain Division." The three soldiers that Atkins saved that day, as well as more than 50 soldiers from the 10th Mountain Division and five other Medal of Honor recipients, were also present for the ceremony. "Everything you have said to me over the last few days has meant the world to me, and it changes my life," Oliver said, addressing the soldiers of the 10th Mountain Division. "The medal is something that I take a lot of pride in, but it's the words that are the real prize, and what really means the most to me. When it comes to my dad, he always had the funniest stories about you guys ... I feel so close with you and to him, every story that I get to hear, and I'm glad that you got to enjoy his love." THE PRESIDENT: Thank you very much. Please. Thank you. And thank you -- please, sit down. Please. Thank you, Chaplain Solhjem, Vice President Pence -- thank you, Mike -- members of Congress, and distinguished military leaders. We are here today to award America's highest honor to a fallen hero who made the supreme sacrifice for our nation: Staff Sergeant Travis Atkins. Please join me in welcoming the entire Atkins family to the White House. Thank you very much. (Applause.) Thank you very much. To the entire Atkins family: We can never measure the true depth of our gratitude or the full magnitude of your loss, but we can pay everlasting tribute to Staff Sergeant Travis Atkins -- his truly immortal act of valor. It was indeed. Thank you. We're also joined for today's ceremony by Acting Deputy Secretary of Defense David Norquist. Thank you, David. Chairman of the Joint Chiefs of Staff -- somebody who is doing a fantastic job -- General Joseph Dunford. Thank you, General. Thank you, Joe. Vice Chairman of the Joint Chiefs of Staff, General Paul Selva. Paul, thank you. Secretary of the Army, Mark Esper. Mark -- thank you, Mark. Army Chief of Staff, General Mark Milley. Thank you, General. Thanks, Mark. Chief of the National Guard Bureau, General Joseph Lengyel. And Sergeant Major of the Army, Daniel Dailey. Thank you. Thank you all. Thank you very much. Great people. They're doing an incredible job. I have to say that. Today, the name of Staff Sergeant Travis Atkins will be etched alongside of the names of America's bravest warriors and written forever into America's heart. Travis quickly excelled in the Army. He was offered a number of different assignments, but always he chose the infantry. He loved the infantry. That's where he wanted to be, defending freedom on the frontiers with his fellow foot soldiers, and they were all his great friends. After he completed the harrowing deployment, Travis returned to civilian life. But not for long. The fact is he was bored. You know that. He was very bored. He wanted back in. As his mother Elaine has said, Travis "loved the Army and he loved everything about being with the troops." He just loved it. In August of 2006, Travis left his second deployment to Iraq. He was stationed in a hotbed of terror and terrorist activity known as the "Triangle of Death." Not a good place. As Travis began to search one of the insurgents, the man resisted and became totally violent. Travis engaged him in hand-to-hand combat. As Travis wrestled to get the enemy's hands behind his back, the man began to reach for something, and Travis knew what it was. He realized the man was wearing a suicide vest. In his final moments on Earth, Travis did not run. He didn't know what it was to run. He did not hesitate. He rose to the highest calling. He laid down his life to save the lives of his fellow warriors. In so doing, he embodied the deepest meaning of the motto of the 10th Mountain Division: He "climbed to glory." Now Travis is looking down from above on all of us -- on all of his fellow warriors, on his great family -- wrapped in glory, the loving glory of Almighty God. We're grateful to be joined by the three squad members that Travis saved: Private First Class Michael Kistel. Michael. Where are you, Michael? Thank you. Please, stand. Stand. Thank you. (Applause.) Thank you. Specialist Travis Robertshaw. Travis, where are you? Travis, thank you. (Applause.) Thank you, Travis. And Specialist Sand Aiyo. Sand, thank you very much. Good. (Applause.) Thank you. Appreciate it. Today, we are privileged also to be joined by more than 50 soldiers from the 10th Mountain Division, including those who served alongside Travis -- knew he was brave from day one. They really loved him. They wanted to be here. Would you please stand? (Applause.) Thank you very much. Thank you for being here. Your lives of service do honor to our country, to Army values, and your fallen brothers-in-arms like Staff Sergeant Travis Atkins. And he's looking down. He loves you all. Just a few days before that June morning when Travis left on his last mission, he called his son Trevor to wish him a very, very special eleventh birthday. Trevor didn't know that he would speak to his dad for the last time. But in the 12 years since, he's always known that his father gave his life for our nation and for our freedom. He knew that his father was a hero right from the beginning, long before today. Trevor has said that he wants our nation to remember his dad as "the best father and best soldier that anyone could ask for." Trevor, that is exactly how we'll -- your Dad will be remembered. He will be remembered truly as "the best father" and he will be remembered as the best soldier. You can't get better than the Congressional Medal of Honor. You just can't. So thank you very much. And I'd like you to come on up. Please come up. (Applause.) Please come up. Please. Your father's courage and sacrifice will live for all time. And every time we see our stars and stripes waving in the sky, we will thank our great Travis and we will think of every American hero who gave their last breath to defend our liberty, and our homeland, and our people, and our great American flag. Now, I'd like to ask the military aide to read the citation. And I would also like, perhaps, in honor of your father, perhaps you could say just a few words. Would you like that? Please. TREVOR OLIVER: Thank you, everyone, for being here, first off. It's an absolute honor to have every single one of you here. It's something that I can't really put into words. It's something that's surreal. And I still -- I still haven't fully accepted it yet. That's -- the medal is something that I take very -- a lot of pride in, but it's the words that are the real prize and what really means the most to me. And -- no, I just -- I feel so close with you and to him every -- every story I get to hear. And I'm just -- I'm glad that you got to enjoy his love and his energy. Thank you. THE PRESIDENT: Beautiful. Thank you.